US, 2016, 128 minutes, Colour. Ben Affleck, Anna Kendrick, J. K. Simmons, Jon Bernthal, Jeffrey Tambor, Cynthia Addai- Robinson, John Lithgow, Jean Smart, Andy Umberger. 1. The title – leading to expectations? 2. The American settings, Chicago, Washington, shops and suburbs, homes, farms, offices, companies? The program for autistic children? 3. The introduction, the tone, police, the camera shadowing the police, the deaths, the room and stairs, the shadow of the gun? The killings – and the recap at the end, Ray King, the links, the consequences? 4. The range of threads in the plot, and their all being brought together satisfactorily – even to the end? 5. Washington, Ray King, about to retire, Treasury? His style, calling in Medina, the interview, her actual file, his hold over her, the quest, to find the accountant? His deadline? The details of her work, detection, studying the criminal gangs, the photos, the reconstruction of the face, the voice techniques, Simon Grundy and the repetition? The names of financial geniuses – with autism or Asperges? The agent and her checking each character? Her shrewdness, targeting Christian Wolff, the range of companies, the photo of the shopfront? Identifying him? Going to Ray? demands, the boys developing their martial arts skills? 7. 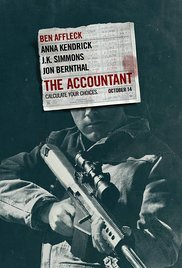 The flashbacks for explaining the accountant’s character? The funeral, his being in the Army with his father, their being ousted, the fight, the father’s death, the accountant going to prison? Meeting Francis in prison, their friendship? Francis communicating all the information, the accountant retaining it? His devotion to Francis? Francis training him how torecognise emotions? Francis as a character, the interviews with Ray, becoming an informant, the prison term, getting out, exposed and taken by the gangs, the torture, his death? The accountant and his wanting revenge? The initial killings and the explanation? 8. Christian, his shopfront, the couple and the interview about taxation, country people, his helping them? The manifestations of his autism, the narrow focus of attention, mathematical genius? Wanting to finish his tasks? The necklace, his suggesting the industry, suggesting the vehicle for their work, the dining room as an office? The tax help? The gratitude? Inviting him out, his hunting, the shooting scenes, illustrating his skills at such a distance – and preparing the audience for this in practice? The attack on the farm, the abduction of the couple, the car, the accuracy of his shooting? 9. Chris and his accountancy skills, working with all the criminal gangs, International? His motivations, finding out the gang who killed Francis and getting revenge? His skills, attention? The genius with numbers and maths? The donations to the institute for autism? His keeping cash? 10. Lamar Black employing him? The phone instructions from the female British voice? Meeting with Dana, her work, discovering the discrepancy, her amazement at his work? Sharing lunch, his autistic responses, not relating well? Drawing on Francis and his training how to recognise emotions? His examining the documents, covering the glass with statistics and dates? Finding the solution? Lamar Black’s friend, for many years, skimming the accounts, the killers coming, his diabetes, the overdose of insulin? Lamar’s sister, her suspicions? The discussions with Chris? Her death? The revelation of the boss behind the killings? His motivations, financial explanations, his wanting robotics to help people with injuries – and his showing Chris the extent of his work? His hiring the thugs? The killer? In the house, Chris infiltrating, killing the thugs, Lamar Black’s speech, Chris shooting him? 11. Simon Grundy, the brothers discovering each other, the hold off? Their talk, memories, the brother and his resentment towards Chris about going to the funeral and his father’s death? The killer seen in action, his skills compared with those of Chris? The reconciliation? 12. The attempt on the couple’s life, blaming Dana? Her being followed, the corridors, the killers, her refuge in the bathroom, her skills in defending herself? Chris rescuing her? Going to the lavish hotel? The talk, her personal story, art student, the story of her getting the dress for her prom, her skills with money, blackjack? Her being in the shed, discovering all his weapons, the paintings? The discussion about the dogs gambling? His leaving? The end and the gift of Jackson Pollock? 13. Ray, the complexity of his life, explaining to Medina, the chances he had, trying to make something of himself, his tracking the accountant, the accountant not killing him, being a family man? His dealings with Francis? The press conference, the praise for Medina, her praising Ray and their team work? 14. The Institute, the autistic boy and his parents, the tour, the director’s daughter and her autism, the expensive machine? And the irony of the British voice who telephoned Chris and setting him on all his quests – and it being the voice of her machine? 15. A satisfying ending, Dana and the paintings? Chris and his driving off in his caravan?